I am happy to post worldwide however you need to contact me by email with your location for a postal quote, after getting tools lost in the post before I only send by recorded delivery. Thanks for looking, regards, Richard Stewart. 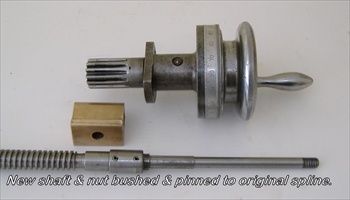 Colchester Lathe "Triumph" (roundhead) model crosslide screw & bronze nut repairs. As an owner myself of a Colchester Triumph (roundhead) lathe, many years ago the threads in the bronze nut in the crosslide got so thin they just collapsed and pulled through. I bought a new one and replaced it, however this still left the screw itself a little worn, but as the bronze nut will wear out quicker, the shaft still had some life in it. Years later the shaft and nut had worn much more, with .090" backlash and both were now getting so thin they would soon both collapse. After much research I found that the nuts and shafts are no longer available. So before the screw wore out completely I decided to make my own, this proved difficult at first but after making a special traveling steady to support the shaft during screwcutting, it worked fine. As I did not have the tooling to cut splines I decided to use the splined part of the shaft and cut it off and bushed & pinned the new screwcut shaft to it. For the nut I made a fixture to bore out the nut and screwcut a bronze bush to press into it and secure it with dowells. As these parts have worked out so well and I now have all the tooling I now offer these replacement parts to other Colchester Triumph (round head) owners, and other types of lathes.